Canada will play Peter de Cruz of Switzerland at 7 p.m. In the other qualification game, Yuta Matsumura of Japan drew the button with last rock in an extra end for a 7-6 win over Olympic champion John Shuster of the United States. Japan will play defending champion Niklas Edin of Sweden in the 2 p.m. semifinal. The nerves were because time was running out for Team Canada. By the time Koe let his final stone go, he had just five seconds left on the clock. Koe, third B.J. 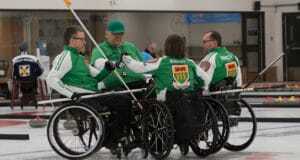 Neufeld, second Colton Flasch, lead Ben Hebert, alternate Ted Appelman, team coach John Dunn and national coach Jeff Stoughton, had a 4-3 lead at the five-end break, having posted deuces in the first and third ends. Koe made a tap-back for two in the first and had an open draw in three when Mouat rolled out on a hit. The Scots were forced into a single in the second when Koe executed a perfect, tight double with his final stone. Mouat, third Grant Hardie, second Bobby Lammie, lead Hammy McMillan Jr., alternate Ross Whyte and coach Alan Hannah, got two in the fourth when both Neufeld and Koe missed shots and Koe had to make a double to hold Mouat to the deuce. 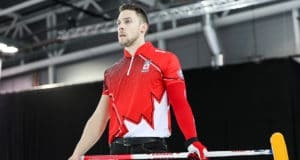 In a game that saw plenty of runbacks and doubles, the teams forced each other to take singles in the seventh thought 10th ends, when Canada, without hammer, set up the house that gave Mouat practically no chance for a game-tying two. Matsumura, third Tetsuro Shimizu, second Yasumasa Tanida, lead Shinya Abe, alternate Kosuke Aita and coach Bob Ursel got the upper hand of their game early, posting deuces in the first and fourth ends. But Shuster, third Chris Plys, second Matt Hamilton, lead John Landsteiner, alternate Korey Dropkin and coach Don Bartlett, countered with singles in the second, third, fifth and sixth to get back on even terms. Japan got one in seven and stole one in nine when the U.S. conceded the point to maintain hammer, which they used to score two in the 10th to force the extra end. The semifinal winners will play for gold Sunday at 5 p.m., while the losers will play for bronze at noon.